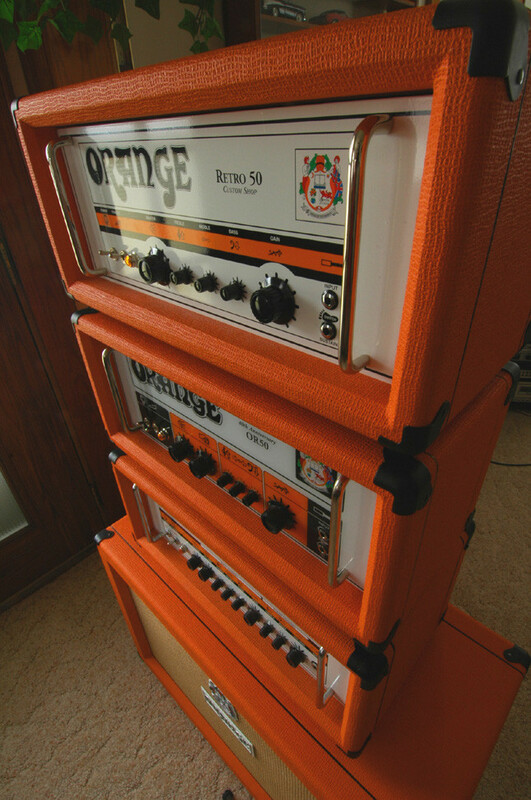 Rig-Talk • View topic - What Orange amp do you have? 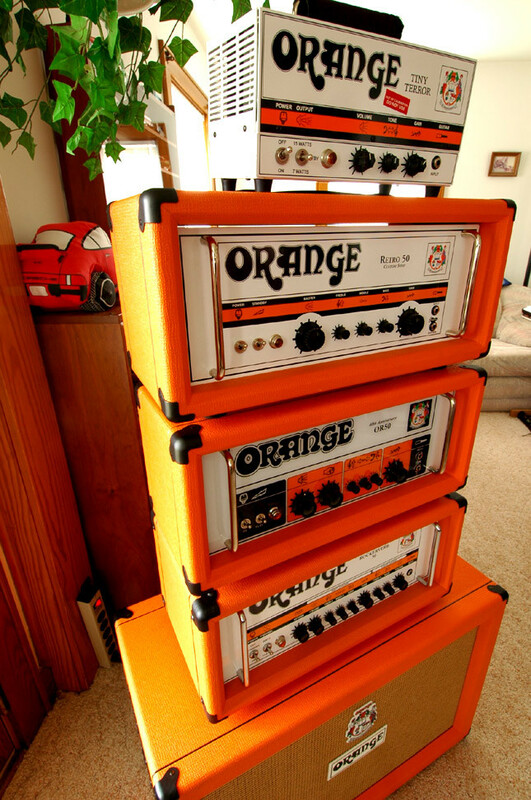 Post subject: What Orange amp do you have? I was hoping everyone could post pics of their current Orange set-up! I'd love to see what everybody has in their arsenal! 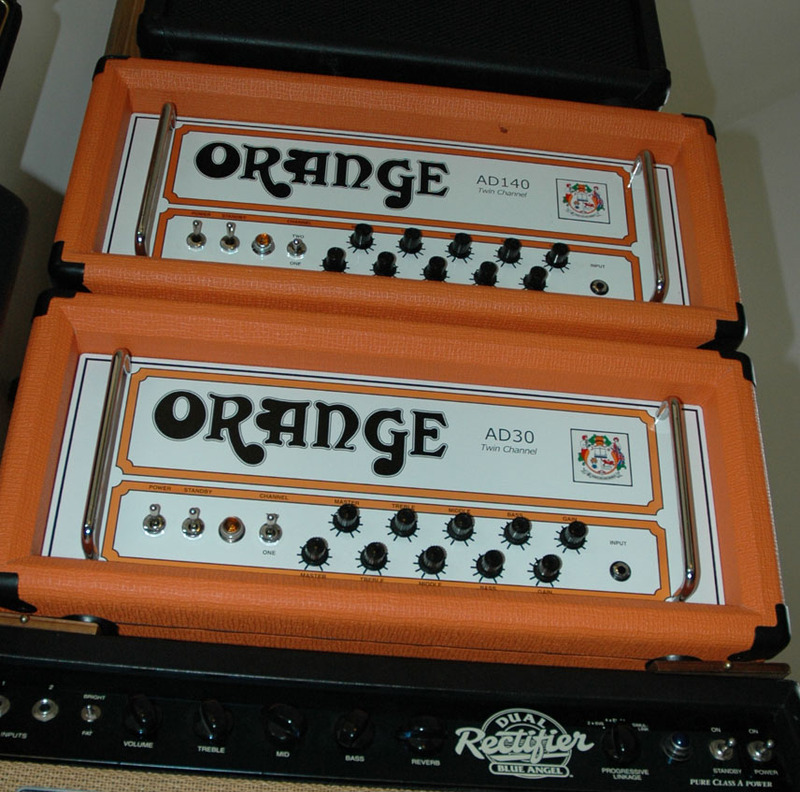 Post subject: Re: What Orange amp do you have? 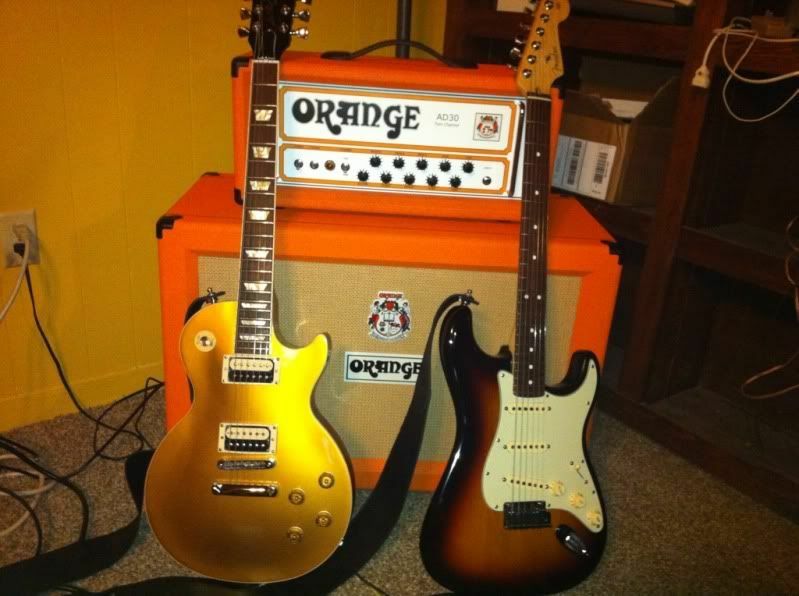 Hey Woodsie, which guitar do you prefer through your AD30? Hey Alex. Well, at the risk of being obvious and cliché... For clean to slightly dirty, I like the strat. For some reason, dirty only sounds good with the single coils if I push it a little more with a Tube Screamer or clean through a fuzz. For dirt, the Les Paul just sounds awesome. I've put a Seymour Duncan JB in the bridge since this pic. to answer your question simply, I play The GT 90% of the time. It has more to do with what I'm playing musically right now than anything else. The Strat was my first guitar (well, this time around anyway) ill always love it. The LP is just it for me though. just realized I don't have a current shot of the entire family... that's no good! '72 on top and '70. Oh wow that's great! What can you tell us about these heads? I'm very curious! It's a custom made OR120 preamp built on the Egnater/Randall MTS platform, complete with FAC, plugged into a custom built 50W RM2 with the Axe FX and a Two Notes Torpedo CAB (not pictured). 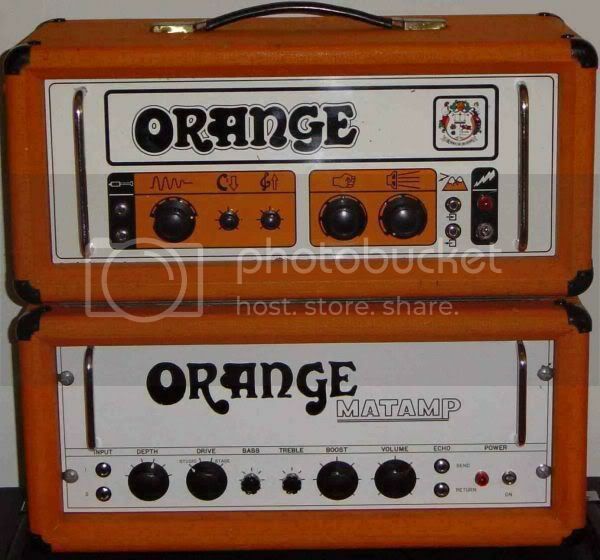 The '70 Orange/Matamp is a rare beast, and one of my all time favorite! Sound wise, I would call it the Mesa Rectifier from the past! It's got as much gain, if not more, than most Marshalls from the same year, but it's also a lot more saggy and with a low/mid that is hard to find anywhere else. Almost fuzzy. Very loud amp! 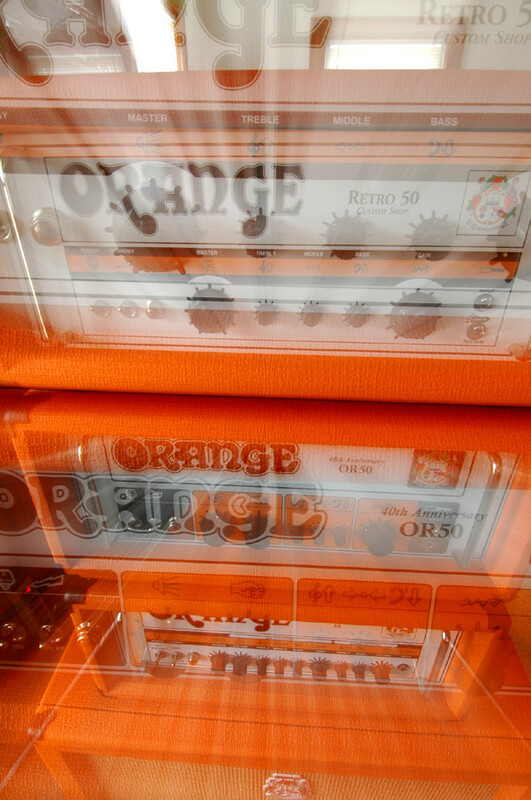 The '72 Orange got a lot more headroom and behaves more like an early Super Bass or a JTM100. 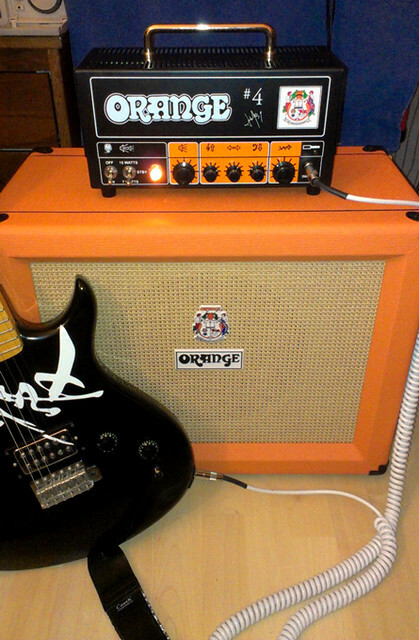 Not as much gain as the Orange/Matamp, and can get a lot brighter, but an amazing amp for a big, bold, punchy sound. 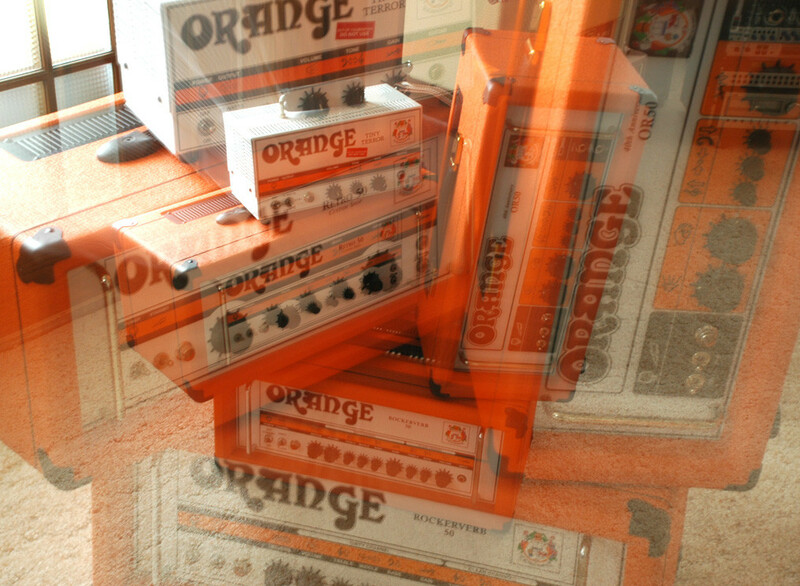 You can get a perfect late 70's AC/DC sound with this Graphics Only Orange. Second loudest tube amp I've heard! First one was an Ampeg V4. Thanks for the info! Always good to hear the differing opinions on our older gear. And I'm totally digging that OR120 preamp in that rackmount too! I've always loved the Orange sound but never could get them loud enough on stage to get them into their sweet spot, so we built our own preamp that we can smack at any volume (and it weighs a lot less too LOL!). We are lacking the inductor tuned NFB presence control in our Torpedo's virtual EL34 power amp, but many on the Orange Forum seemed to advise us that it's contribution was minimal? Do you have any advice on that aspect, the inductor tuned presence control of the vintage OR120's power amp? The concept of the Bauxendall EQ with FAC is a very flexible tonestack, and I'm happy to report that our MTS OR120 preamp gets a lot of use (often pushed with a OD/Boost pedal, though V30's, Fanes, or Scumbacks typically)! 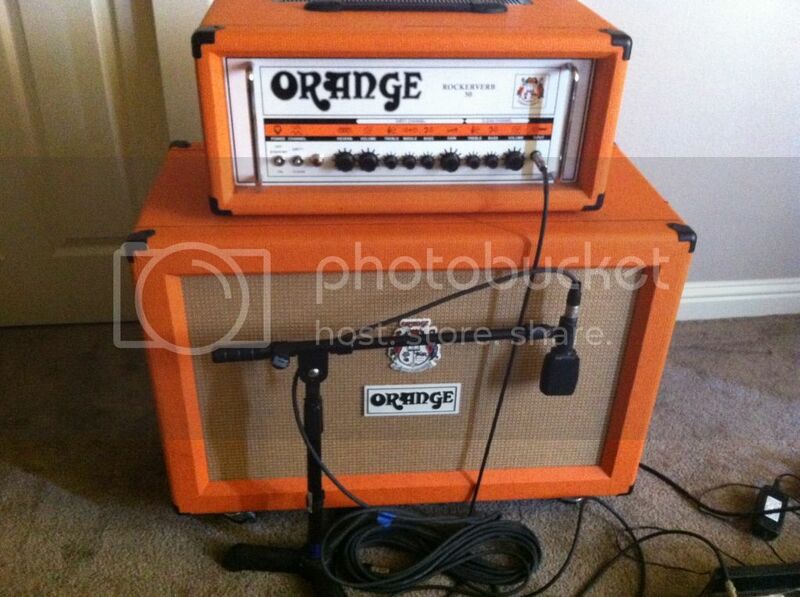 I have an Orange TH30 ran through an Orange 4x12 loaded with Celestion V30's. Sounds sweet. Looking for more wattagethough and considering a TH100. Anyone play through one? I only have a humble Tiny Terror and PPC212. Just got the TT hard wired head...what a great machine. Can´t understand why Orange stopped making them. I got an AD30 + 412. Pretty solid amp! I'm not sure what this means for the AD30HTC. I don't think i can afford to keep both. 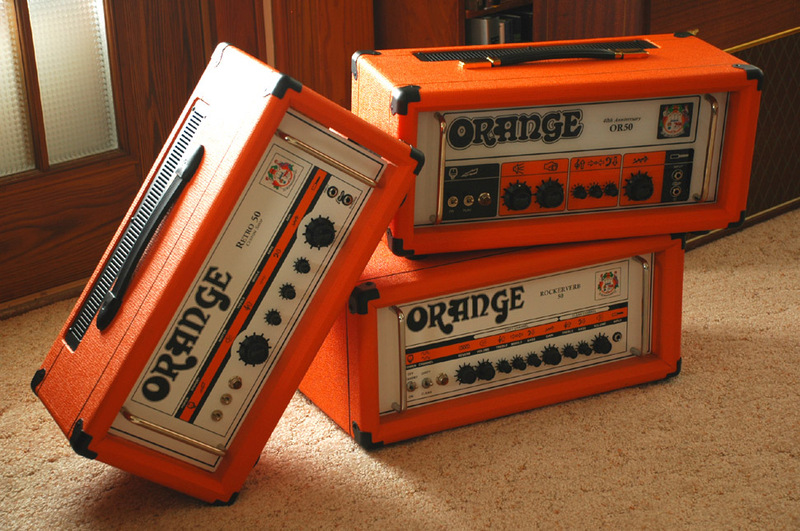 pretty pricey amps. Decided the AD30 wasn't enough for me. great for what it is but just wasn't for me. 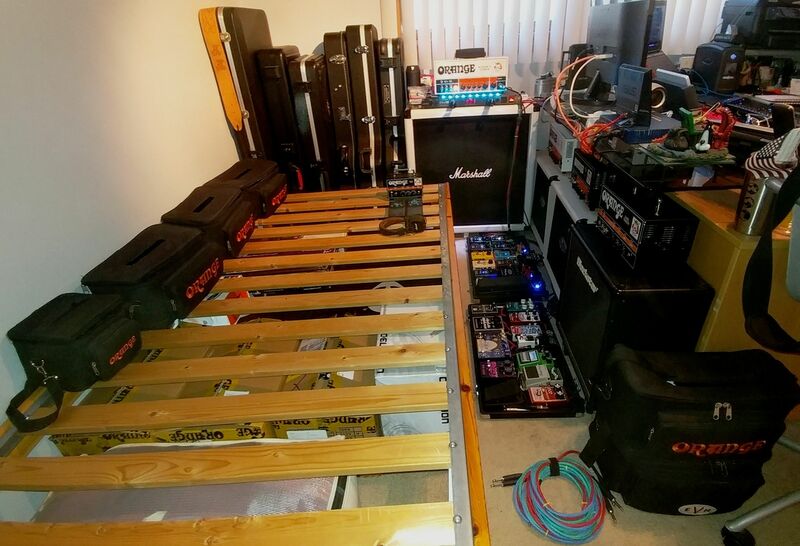 So, i have recently aquired this rig. Got a great deal on both, brand new. I replaced the chinese tubes it comes with with EHX 12AX7's and Winged C EL34's. Sounds great and has more gain availble then i'll ever need. To be honest I love them all. They are all just different enough to keep. Been thinking of getting an AD30htc head for some Zep tones. 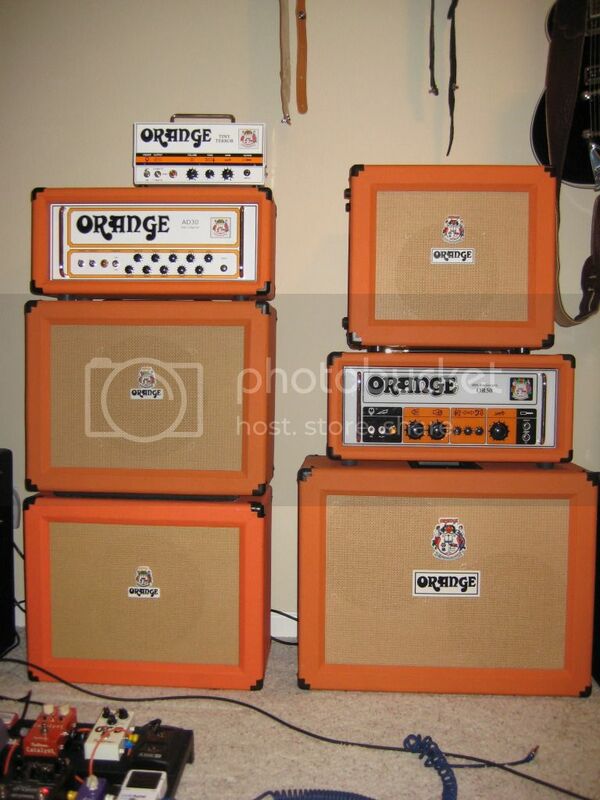 I have a Mesa MK III and Mk V and thinking of kicking the Mk III for an orange. Just got rid of an AD30HTC. I didn't have the post count to list it here. Great amp. 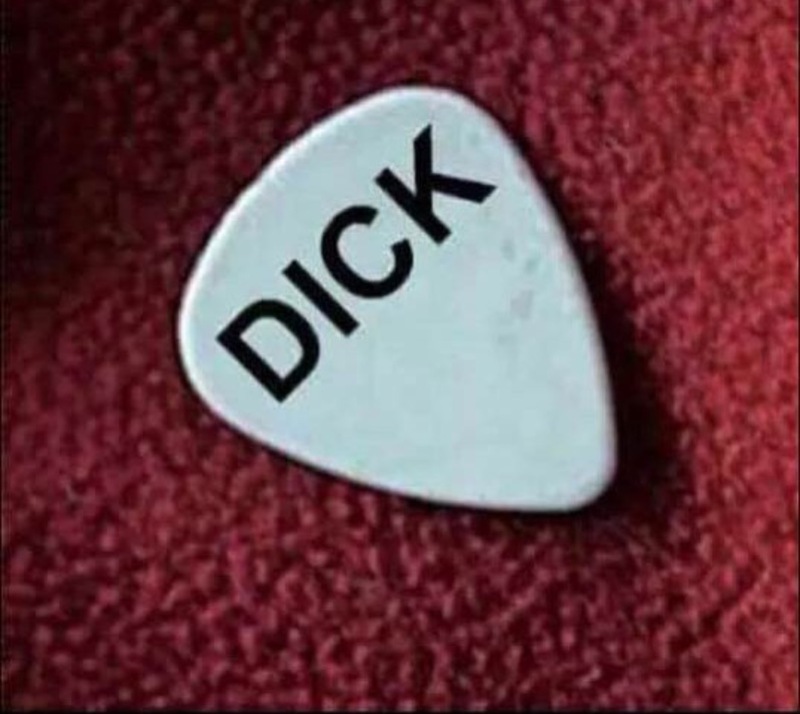 Does mid gain, classic rock really well. Finally moved away from 100lb 4x12s! What's shakin fellas... First post. Figured I come to the Orange section. Well, let me take a looky here.... ? I tried a few and settled on the Retro 50.... to me that one had the best tone out of the bunch!! They are all pretty good though. 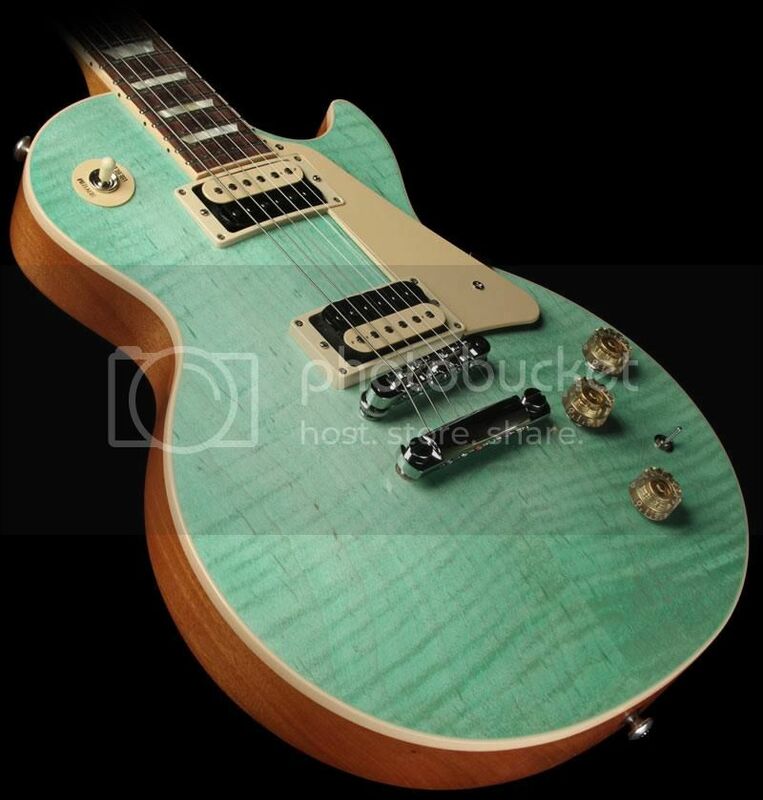 Les Paul Custom .... the most POWERFUL guitar on the Planet! One power chord can clean blow your head right off !! ! No tubes, no standby but awesome! Hands down the BEST solid state I've owned or played! Another AD 30 here! 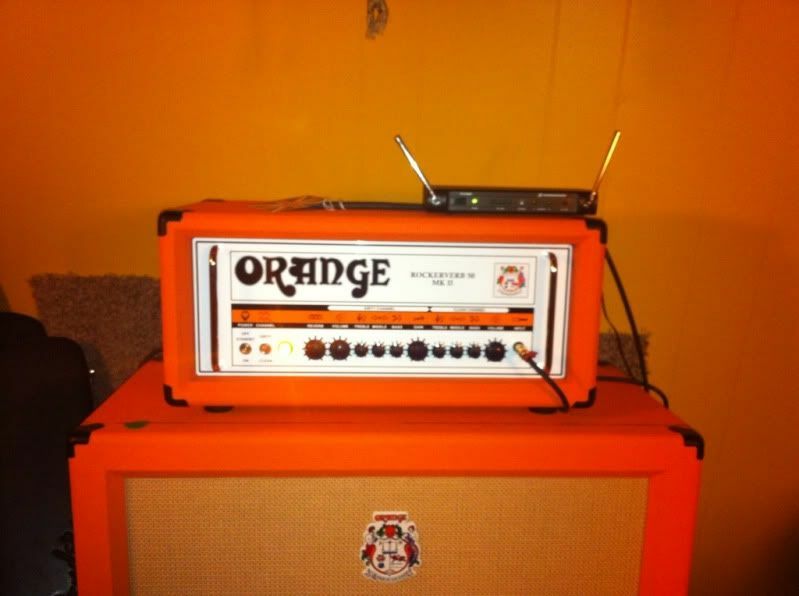 Awesome amp. figured i would use this to introduce myself to the forums ...soooo hi! 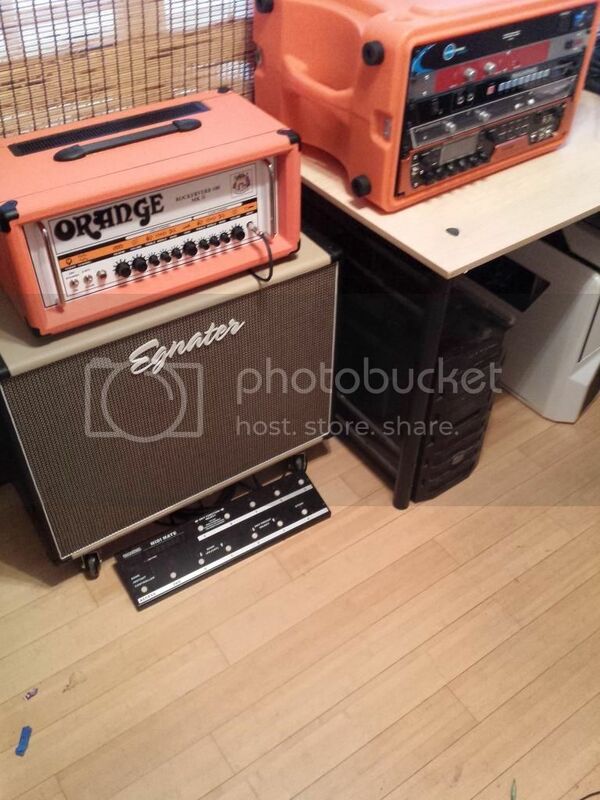 my 2014 Orange Rockerverb 100 MKII and my rack set up. 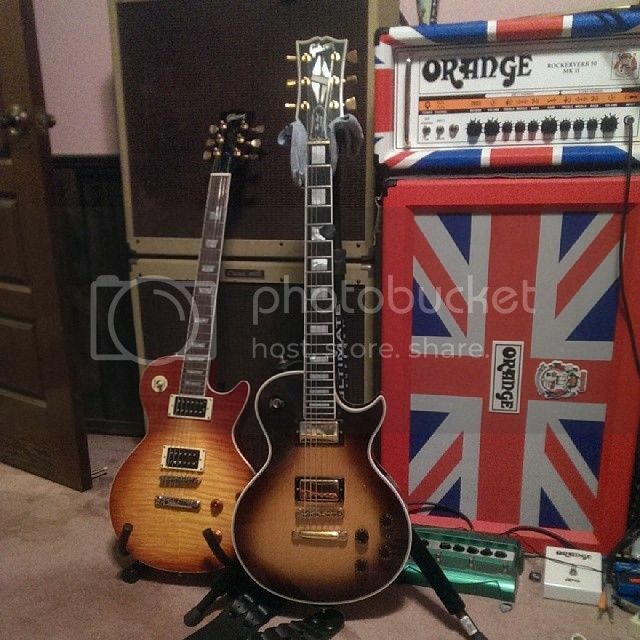 the Egnater cab is just for home practice use, my normal cab is a Marshall MF280B cab. it has served me well but i think it is time for a new cab. I was hoping everyone could post pics of their current Orange set-up! 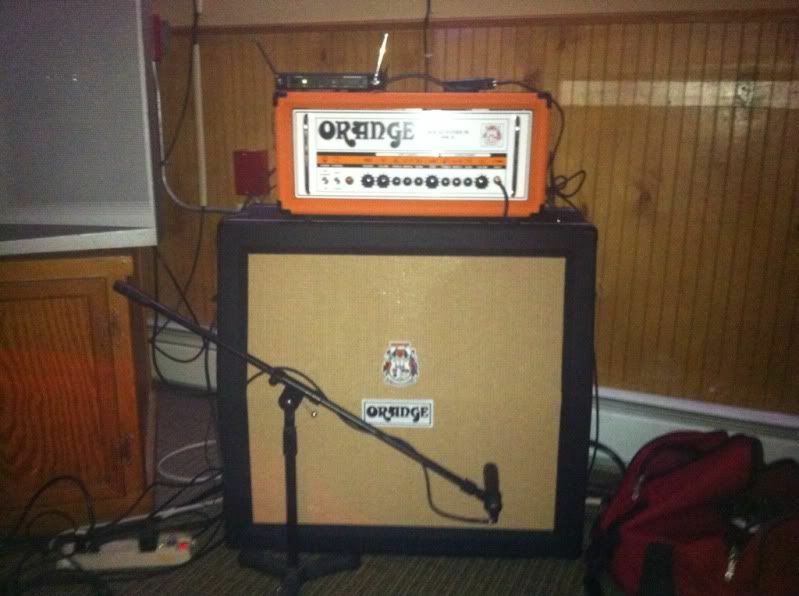 I'm happy to own an awesome Orange AD30TC combo. 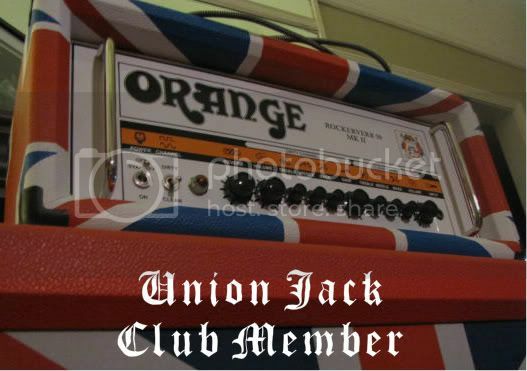 Great amp for all kinds of rock. With the right pedals in front of it it can also deliver serious metal tones. Also love the "clean"(er) channel of the AD30. Started out with a Micro Terror running through a custom 1x12 with a Avatar/Fane M65. Like the sound so much I just picked up a Dual Terror. Running that through an Egnater TM2x12 with a Celestion Classic Lead 80 and an Eminence Man -O-War. I love what I've heard of the Dual Dark and came close to ordering one a couple times, but I can't get past that single knob eq on Channel B. That would drive me nuts.